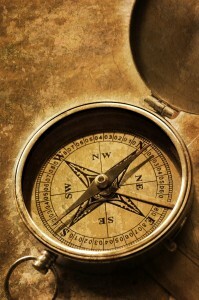 A compass is a navigational instrument that measures directions in a frame of reference that is stationary relative to the surface of the earth - but you knew that! Just as an explorer needs to check their bearing now and again, so do we. Things in life (other than God) that have kept me pointed in the right direction, with the greatest positive influence include the shared love of my family, music, service to others, children, interaction with people who have a bright, positive outlook on life, the outdoors and well behaved dogs. Conversely things that have caused my metaphorical compass to point me south include over indulgences of any kind, hints of immorality, thoughts of power, illusions of pride, inflated egos, and people who claim to be absolutely right about abstract concepts and matters of faith. Our Father in Heaven is still shaping each of us, whether we accept it or not. The sooner we realize this; our life will become easier or at least more tolerable. For example, my temper will always flare if someone tells me their Jesus is better than someone else’s Jesus or when someone shows disrespect. In these shaping moments God has just put me in, I need to realign and realize that if I continue to be angry and judge, I will end up becoming like the older brother in the Prodigal Son story (Luke 15:28). I will, and experience has shown I have, meander away from the Lord and things will only become worse. This has been one of my most repeating life lessons. Other significant alignments have come to me while in quiet time with God. I have frequently found peace in any building or place of worship and sometimes have created my own at a picnic table. When I take a drive in the car or walk down the road with my thoughts directly in prayer; that can help me beyond measure. I am finding more peace and wisdom in the Scriptures than ever before. At important times I have even heard God speak to me while I was praying. These times have been seldom, but none the less significant and real.